Play All is an extension for the Firefox browser (version 1.5 to 10), to read with one click all the linked multimedia files of the current page into your favourite player. 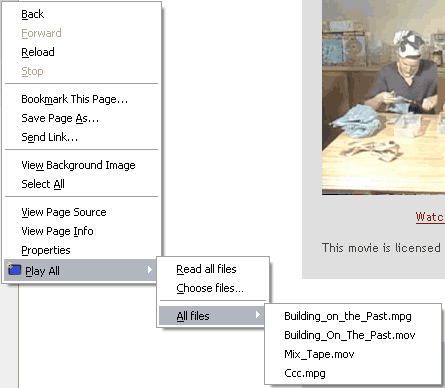 Play All add an item to the contextual menu, and a new button for your toolbar. Right clicking on the toolbar, choose 'Customize...', drag and drop the 'Play All' button. On Mac, the new version of Play All should work. You will have to complete yourself the path to the executable, to target the real binary executable inside the .app Package. 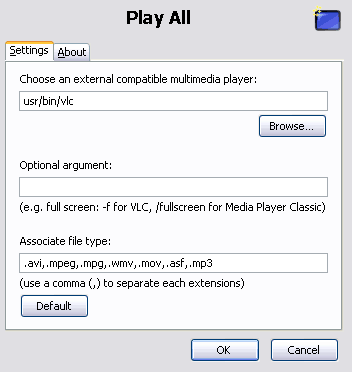 MPlayer (original version) seems to work correctly, with the optional argument playlist. VLC seems unstable, with the tested version :( . 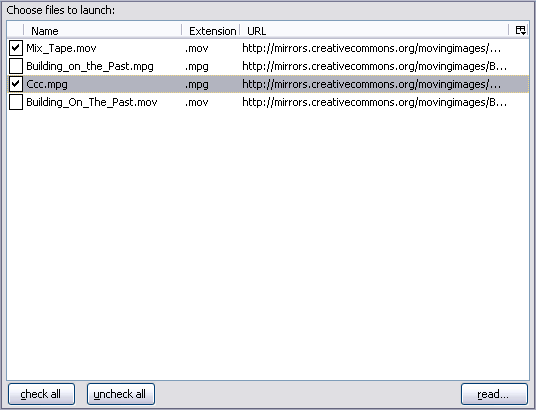 A priori, all readers being able to be launched with command line, with a list of links, is compatible. examples, full screen : -f for VLC, /fullscreen for Media Player Classic. All imbricated Frames are treated. English (en-US), french (fr-FR), arabic (ar), catalan (ca-AD), chinese (simplified) (zh-CN), chinese (traditional) (zh-TW), corean (ko-KR), czech (cs-CZ), danish (da-DK), dutch(nl-NL), finnish (fi-FI), italian (it-IT), polish (pl-PL), portuguese (pt-BR and pt-PT), romanian (ro-RO), russian (ru-RU), slovak (sk-SK), spanish (es-ES), turkish (tr-TR). Firefox 1.5 to 10 compatible. add some locales, thanks babelzillians ;). add locales corean, simplified chinese, traditional chinese.